Are You Playing It Safe Or Aiming For Greatness? Do You Feel Like You Need An Extra Hours Every Day… To Accomplish today’s Work? Would You Love To Have More Time Each Day To Get It All Done? What If You Could Slow Time Down To Get More Completed Each Day With Less Stress? Now You Can! You Can Find Out How Mavericks Get More Finished Each Day. 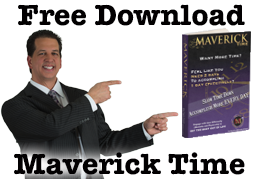 Download Maverick Time Now! Esther C Bleuel on Are You Authentic? Abell@peakperformancesalestraining.us on Do You Want to Close More Sales?